We have a box full of old mason jars that have been collecting dust since the days when we canned homegrown vegetables and read Mother Earth News. 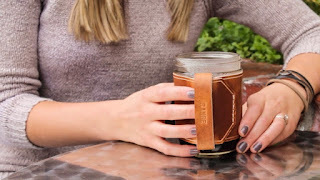 Leather craftsman Kyle Koster has come up with a way to turn those old jars into a drinking glass, travel mug, coffee cup or canteen. It’s called the Range Mug and it provides a handle and a thick 10 oz. leather wrap that helps keep liquids hot or cold. The handle and wrap fits snugly on the glass and slides off when it’s time to wash the jars. Koster has launched a Kickstarter campaign hoping to raise $2,500 to get the Range Mug into full production in time to ship them in December. Backers can get in line to receive a mug at 30% off the retail price by pledging $22. For more details and other reward options, check the Range Mug Kickstarter page.